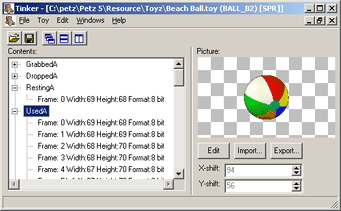 Tinker is a program to edit toys, clothes on-shelf graphics, playscene items, and other filmstrips for Petz 2,3,4,5, Babyz and Oddballz. Tinker also lets you edit the Petz 5 toycase to allow you to add custom toys to your toycase. Note that you should not add the Hermit Crab to your toycase - it will cause a blank entry in the toycase to appear in Petz which will crash when you click on it. Don't forget to keep backup copies of the toys that you plan to edit. Please note that you must leave at least one frame in each animation. Tinker and Petz cannot read Toyz that have 'empty' animations. Fixes a bug that would cause the error "Can't find caseinfo.lkv" if you installed Petz into the root folder of your drive, and tidied up the carrying case editor to make it easier to use.